Epoxy.com Product #870 Epoxy Sealer is a two-component penetrating epoxy sealer (with very high solids) designed for superior protection of new concrete or for prolonging the serviceability of partially-deteriorated concrete. The sealer is a low to medium viscosity material and is capable of providing an effective membrane barrier to inhibit moisture migration and corrosive chemical penetration. In the cured state Epoxy.com Product #870 allows moisture vapor transmission; it seals off moisture entry but still allows the concrete to breath. When applied to concrete placed and finished in accordance with standards defined in ACI 201 (Guide to Durable Concrete), Product #870 greatly improves wear resistance of the concrete surface, slows down the corrosion of reinforcing steel and adds many years' life to the structure. Product #870 has a solids content of 50% after curing. It may be applied to dry surfaces at temperatures of 40°F (0°C) or above. 1. 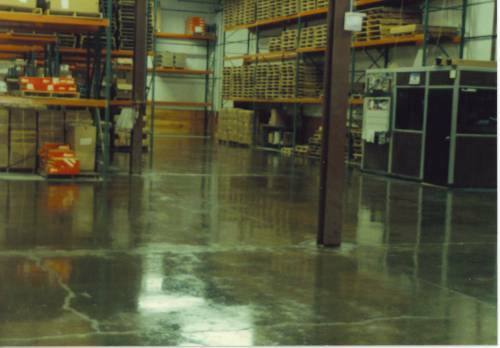 The concrete must be cleaned free of old existing coatings, oils, grease, dirt, and wax solutions. 2. Sandblast or water-blast surface to remove contamination, heavy laitance, sharp edges or protrusions, if there are any which could interfere with the uniform application of the sealer. Use of acids is not recommended. 3. Weld structural cracks with Epoxy.com Product #684; seal movable cracks with Epoxy.com Product #11 Control Joint Filler. Remove unsound existing patches and fill chuck holes and deteriorated areas with Epoxy.com™ 10 Mortar or Product #25 Mortar Kit. 4. Remove all debris from working surfaces. 5. Allow all Epoxy.com products used in repair to fully cure before application of Penetrate Sealer. Supplied as two-package system. Open Component "A" and agitate resin until evenly blended. Open Component "B" and pour entire contents into Component "B" into Component "A". Agitate the combined mixture with low speed power mixer (200-300 rpm) until one even color develops (2-3 minutes). Penetrate Sealer may be applied with roller, brush or airless spray. Ensure that the concrete surface is dry, moisture will interfere with product penetration. Two coats are required for most applications. Apply #870 evenly over area according to coverage requirements. Concrete surfaces will accept the sealer at different rates because of porosity, moisture content and other variations and this may result in discoloration or darkening of the finished surfaces. For skid resistance broadcast clean, dry sand at a rate of 1-2 lb. per square yard. Prolonged or repeated exposure may cause eye and skin irritation. Avoid contact with skin or eyes. If contact occurs, wash immediately with soap and water. Flush eyes immediately with water and contact physician. If used indoors, provide adequate ventilation. Use safety glasses, and wear protective rubber or polyethylene gloves. Epoxy.com #870 contains flammable solvents, so extra precautions should be taken in confined areas. Never allow open flame or sparks in area when #870 is being applied. Adequate ventilation must be provided when applying.